GPS tracking shows what actually happened on the water - to you and your competitors. TackTracker makes GPS tracking and race analysis available to every racing sailor, yacht club, class association and coach. The TackTracker Cloud is a huge library of races published by TackTracker users around the world. Watch races in our web player, or download the TackTracker player and race analyser for Windows or macOS. Many races are recorded live and you can watch them as they happen from anywhere in the world. Sign up to the TackTracker Cloud and record your own races. Get out your smart-phone and be tracking in minutes! New users get 18 days tracking free. Visit the shop for pricing options. We also have dedicated tracking devices if you don't want to use a phone. 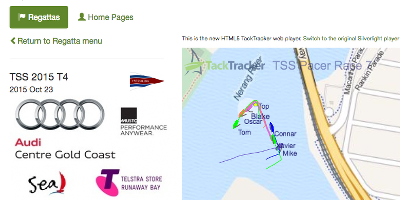 TackTracker adds huge value to any regatta. Most sailors finish a regatta with nothing to take away, but if the regatta is tracked, every sailor has invaluable data that will help them improve. 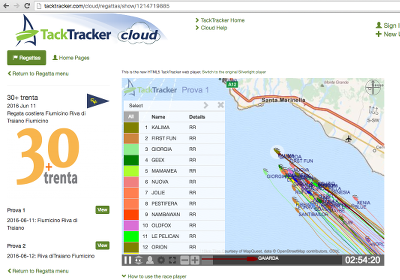 TackTracker can help with competitor safety too - with a real time competitor tally that reports who is onshore and who is on the water. Use tracking to increase the value to your sponsors. Our data shows that many people view their races again and again after the regatta is finished, increasing your sponsor's exposure. We do Logged Tracking Too! GPS loggers are accurate, reliable and cost effective. TackTracker integrates seamlessly with QStarz loggers to create the perfect training and post-race analysis tool. Use the Logged Tracking License for Yacht Racing, or the Navigation Rally License for running power boat navigation rallies. "TackTracker is really great for the A-Class cats at Elwood Sailing Club. We analyse VMG's, bearings and speeds to determine who went well and why. I love the live tracking with so little admin time required." "The S80 Association of Victoria have been using TackTracker for the past 5 years with great success. Our members really enjoy replaying the races to see where they went right (or wrong..!). The detailed reports are easy to use and provide a wealth of information to learn from." "TackTracker greatly accelerates Dragon sailors' learning about tactics over a coffee the next morning and enhances a Dragon spectator's experience."